With regards to reading, this month was rather underwhelming. There were a few books that I loved, but most of them I was ambivalent about. David's favorite book in October: Good Luck, Anna Hibiscus! What was your favorite book in October? 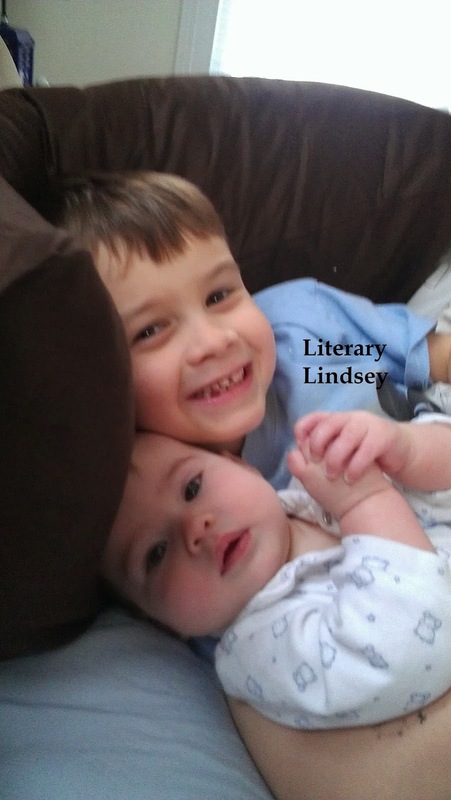 Happy November from the tiniest and cutest of readers! Wow, I think 11 books in one month is quite impressive! I usually manage between 6 and 8. I totally agree about this time of year - time just speeds up. And like you, we have a birthday, too - my son's is January 13, so it's like the holiday season just keeps going! I'm trying to at least THINK about Christmas early because the late Thanksgiving is going to make December even more hectic than usual. I have started my gift list though not actual shopping. Love the pic of your boys - reminds me of mine when they were those ages - they are now 19 and 15 and still very close. I just did my October summary, too. Thank you Sue. It was a good month for getting through books. It sounds like you are on top of things thinking about your gift list already. I should get started!